This movie gives me an opportunity to talk about remakes, because it is a double remake. It is an American remake of the French film “Arrival of a Train at La Ciotat,” which thrilled audiences by showing them a train’s approach at a close angle, producing the illusion of being in its path while sitting in the theater. But, it’s also a remake of itself: the print we have was shot because the original print wore out, and Edison’s men had to go back out to the location and re-shoot it, a lesson in the importance of film preservation. Today, a lot of film buffs are disparaging about remakes, failing to realize that the way cinema has developed and grown has always been through riffing on common themes, borrowing from other filmmakers and paying homage to the past while looking ahead. This movie was no exception. It was a huge hit for Edison, and probably contributed to the realization that movies were not a minor curiosity, but a major entertainment medium with a future. 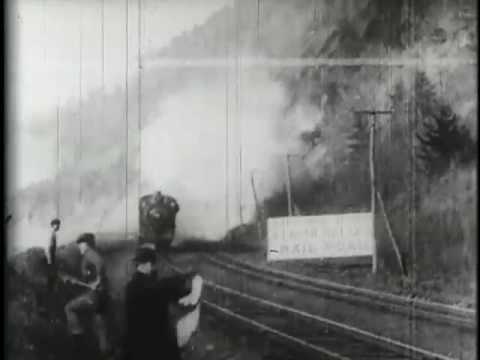 It’s interesting that trains were such a popular subject for the early movies, but it also makes sense. The railroad had transformed the world within the lives of people, in much the way that the Internet has 100 years later, people were fascinated by trains, even as they were apprehensive about their speed and power.